The ribbon-cutting ceremony for SiteOne’s Doraville, Ga. location. 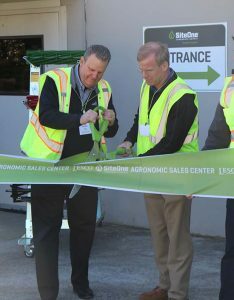 SiteOne Landscape Supply opened a new agronomic sales center for the Atlanta area during a ribbon cutting ceremony this week in Doraville, Ga. The 30,000-square-foot facility officially began operations in late February. The new facility will enable SiteOne to stock up to 880 tons of bagged agronomic material to serve customers who frequently purchase large quantities of fertilizer and control products. This facility also offers a wider assortment of agronomic and control products, including its own private label LESCO products. Landscape tools and supplies, irrigation equipment, landscape lighting and golf course accessories are also available. John Gertz, vice president of category management at SiteOne, leads the company’s agronomic business. He believes that creating this distribution infrastructure is a necessary step toward elevating SiteOne’s position within the Atlanta market, according to SiteOne.